Salzgitter Mannesmann Stainless Tubes (France), one of the worldwide leading manufacturers of seamless stainless steel and nickel based alloy tubes and pipes, has again entrusted Fives with a contract, for the design, manufacture and supply of a Bronx six roll 6.CR9.S straightening machine, complete with ancillary electrical and hydraulic control systems. Six months earlier, Salzgitter Mannesmann ordered a very similar Bronx machine – a six roll 6CR10-HD straightening machine to process high-yield stainless steel tubes up to 280mm in diameter, and at wall thicknesses of up to 50mm. This equipment is to be integrated into an existing space-restricted workshop layout in order to withstand the arduous loads associated with processing such thick-walled tubes. 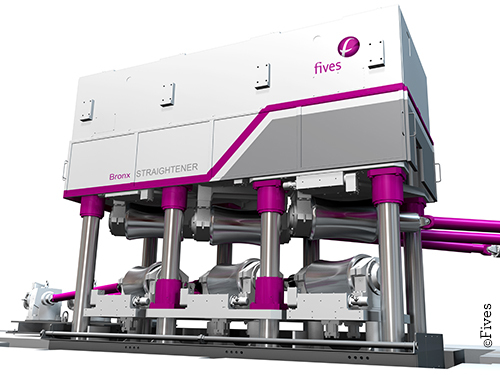 Both machines will be installed during the summer shutdown after a full inspection at Fives’ workshop in England, where the group has been manufacturing its straightening products for the production of tube, pipe, bar and profiles under the brand Bronx for more than 75 years. “The second contract was awarded to Fives, as a consequence of the excellent working relationship that has developed between the client and ourselves, over the past twelve months. It is a credit to all personnel involved with the project, to enable the client to have the confidence to purchase a second machine from us, without yet having taken delivery of the first project,” said Jon Dunn, Managing Director at Fives Bronx Ltd., Fives’ subsidiary in England.